I love the look of your biscotti but I love this post about your mom and her biscotti and her adaptions of it even more. Thanks, I love my mom too. 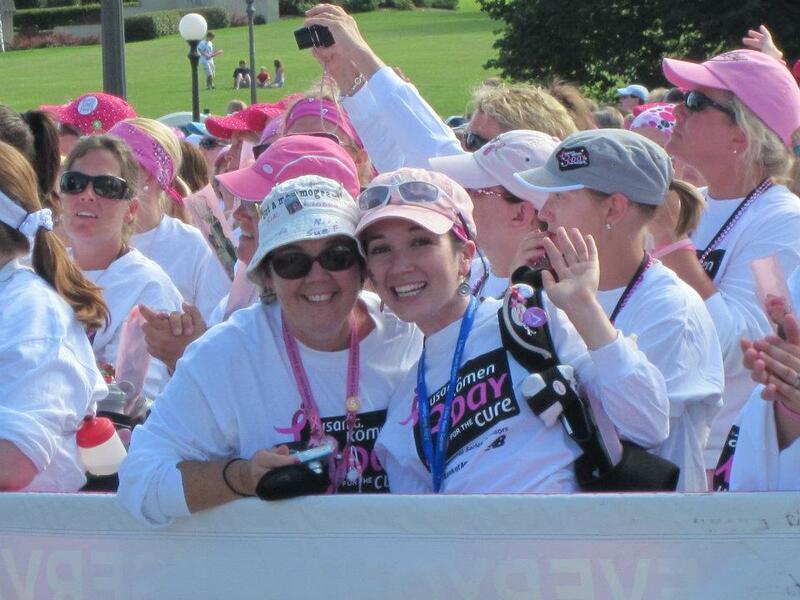 She’s so special, and has been so supportive through my years of illness and health, coming to doctor’s appointments with me, cooking healing foods, taking on the Breast Cancer 3-Day with me all over the country for 7 years now… a really special lady, I’m lucky. Love it! Love the history, thank you for sharing that with us. I am so, so glad you are a part of the Recipe Swap – I always look forward to your posts, especially the part that demystifies gluten-free baking. Can’t wait to see your next adaptation! Thanks CM! And thank you so much for including me – it really is one of my most cherished blogging experiences, and I feel so in love with this group of people I’ve never met, and so thankful to get to participate! Hi Jacqueline. I was particularly interested in your recipe as I have my grandmother’s biscotti recipe which I have not endeavored GF. I will now give it a try. I think something is missing in your sixth ingredient (‘2 cups ???’). Would love to know what that is. Thanks for sharing your sweet memories and recipe. You made me laugh… my kiddo doesn’t do well with dairy and I do the same thing as your mom from time to time … AH CR**P! I’m SO SORRY I missed that one. Getting there tough… Great post and I am very glad to have met you thru the swap. I LOVE that you got that! One of my favorite quotes ever :) And that’s all really funny and lovely – I cherish my mom just for trying as so few people can cook / bake for me or even attempt. And seeing how much she’s learned in the 18 years I’ve been dealing with this is so amazing and special and appreciated, as I’m sure your kiddo appreciates / will learn to :) And I’m so happy I met you through this swap too!! 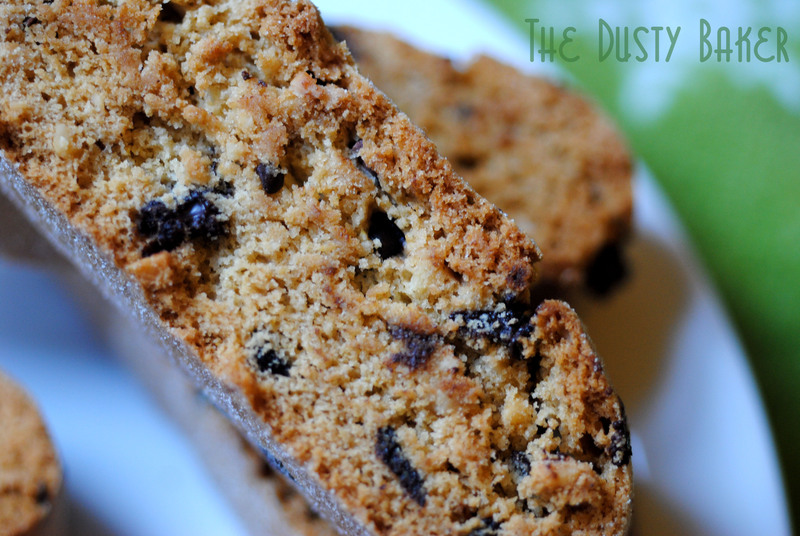 What a great spin on the recipe…I always think of biscotti during the holidays. They are such a great present to give out. And really good to know that it is possible to make them GF! They were a little crumblier before toasting than traditional biscotti but once toasted were perfect in texture and taste. Great idea making them presents!!! I’ve made so many holiday treats over so many years but now I’m wondering, ‘Why not biscotti?’ I love them with coffee and yours sound wonderful. Very creative swap. Thanks! It was a yearly classic with my mom, and as she doesn’t make gluten free cookies often throughout the year, it’s one I’ve come to cherish. And now I have my recipe! I was so hoping someone would do a biscotti. I’ve never tried making my own but think I must try this holiday season. I love how close you are to your Mom. I miss mine every day so I always gets sentimental during these kinds of posts. I am going to try this recipe out. Simply delicious and making me crave biscotti. Thanks :) I get to see my mom a few times a month but love channeling her in my kitchen, and as I’d never made these before it was a special swap for me. 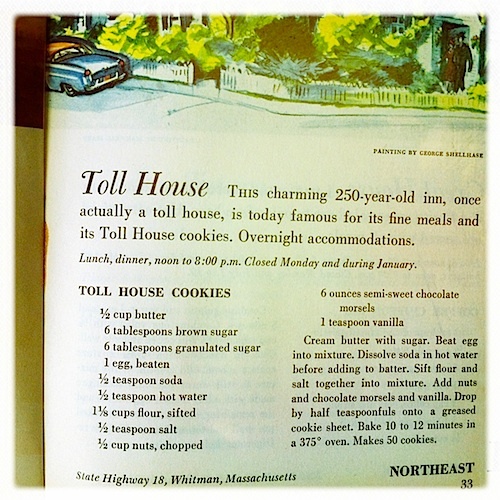 I LOVED that Toll House book… Happy Holidays! I do love twice baked cookies! So nice to enjoy them with some freshly brewed tea with friends and family. Looks amazing, and I love the swap! I have a friend who can’t have gluten, and I’ve been looking for the perfect holiday treat to make for her. Thanks for the inspirations! This is so great. I love the tribute to your mom and the heart that went into this post. Plus, the biscotti look fabulous! Wonderful swap all around! And as for the book, only the favorites makie it to that cover!, the rest are kept in a box on my refrigerator! HI MOMMA!!! Look at you trying to be all anonymous :) Subtle subtle hint: I know how to make MINE. So I’d rather have YOURS ;) I love ya! Ooo I love biscotti. Yours look fabulous, but it’s true, nothing is ever as good as when someone you love makes them for you. I hope your mom takes the very subtle hint you dropped. Mom’s are the best! Cookie-baking is probably one of the most important things we learn from them. I can really see how close you are with your mom from this post. 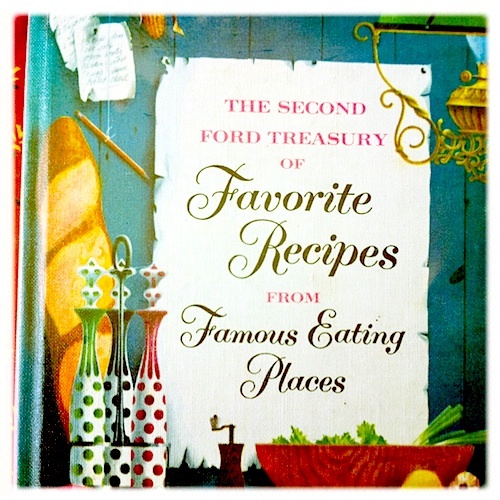 Her recipe book clearly holds special meaning for you that all the internet recipes can never replace. Your biscotti look fabulous! 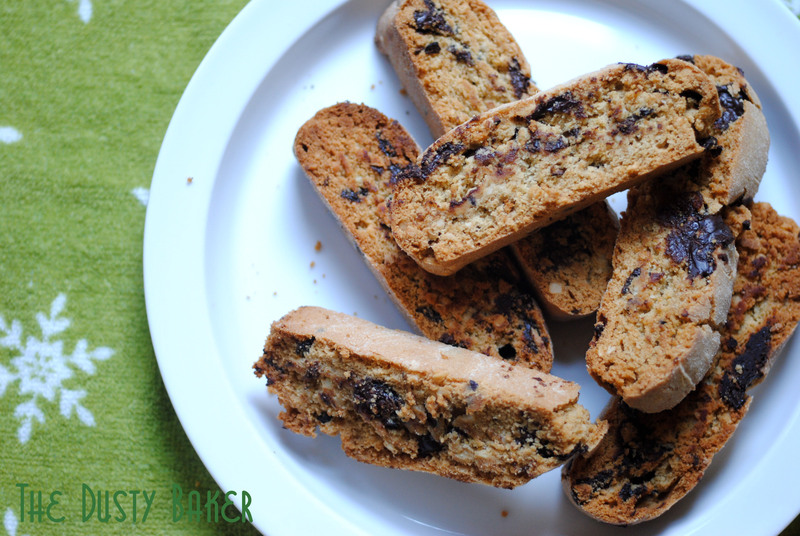 I’ve never actually made biscotti before…maybe because my mom never did! Perhaps my Christmas cookie plate should have a gluten-free option this year. I love biscotti and never thought they could be gluten free! Wow, what a delicious recipe! what would we do with out mothers…..the world would be an awfully cold world without them, thanks for sharing some of the memories of yours with us. 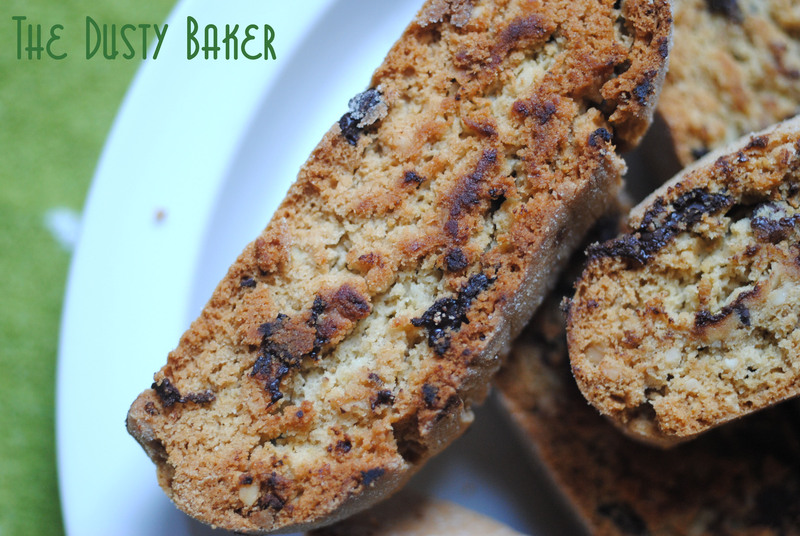 I really like biscotti, particularly when dipped in sweet wine or passito… You have to try it instead of coffee! That is a BRILLIANT idea. Is that kosher at 4pm on a Monday? Cause it’s been one of those days and I’m sorta ready now!!! This is beautiful biscotti! Did you use 1 cup brown rice flour? or is there a different brown flour that you used? I’d love to surprise my GF best friend with something like this for Christmas. Hahaha… we did roll our eyes quite a bit, and laugh at her good intentions. She was always so excited and then SO disappointed. I love her to death! Yes, I used brown rice flour. White rice would work as well. Just make sure you have enough starch and gum to pull it together, as they’re a little hard to slice before toasting. Let me know how they come out! Hi Jacqueline, these look just lovely and remind me of happy days in sunny Italy – a welcome memory in a snowy Scotland! They’d make a great Christmas gift too! We don’t have biscotti in Serbia and when I was in Italy I never tried them:( And now, more then ever, I would love to try your mom’s recipe, original and with substitutions (our youngest is Type 1 diabetic and Celiac disease sometimes comes along, just for fun). Aw, thanks :) I love that photo too, one of my favorites, and she just looks so happy! She sometimes omits chocolate chips and uses orange juice for sweetening and for moisture, which is also very Italian. Please let me know what you do to adapt – I’d love a lower-sugar version. Chocolate and almonds! yes, please. Love the fact that these treats are gluten free. Thanks! I’m sorta regretting having given them all away :) Might have to make them again soon. I loved reading this post. I think thats the best part of sharing recipes- you also get to share some beautiful memories that each dish has along with the recipe! 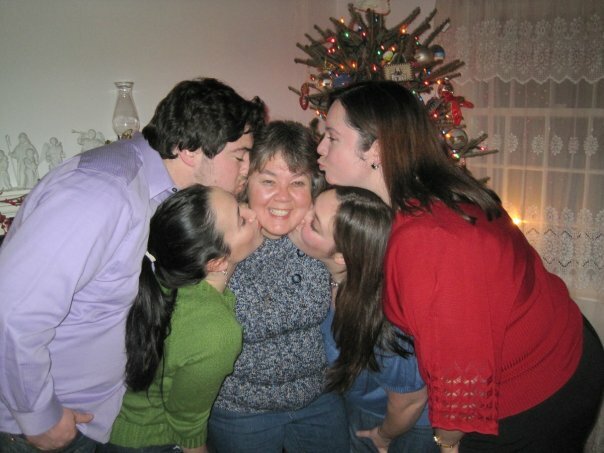 Love the photo of your mom and the dusty sibs! And the chocolate almond biscotti sounds divine! Have never made a biscotti before but its been on my list of things to make. Thanks! I’d never made biscotti before either but now find myself CRAVING them! These look great! On a scale of 1-10, how crunchy are these? I’d give em an 8. They still have some heft and aren’t “crispy” as much as “crunchy”. That can be altered in the toasting time. Ooooooh, biscotti! These look so lovely, and I am in total awe of your gluten-free wizardry! Your site is wonderful– I come from a theater background myself, so I really appreciate the way you combine the performing arts and the culinary arts in such a fun format! I have yet to make biscotti myself – this looks like a great recipe (minus the almonds because of my nut allergy)! My grandma used to love biscotti, I should try my hand at it – thanks for the inspiration! Aw, thank YOU! I love biscott0 – something of an older generation to it!